N 41° 29' 37" and E 2° 17' 40"
Alella in Barcelona (Catalonia) with it's 8,859 citizens is a city in Spain about 322 mi (or 518 km) east of Madrid, the country's capital city. Local time in Alella is now 07:20 PM (Monday). The local timezone is named Europe / Madrid with an UTC offset of 2 hours. We know of 9 airports in the vicinity of Alella, of which 3 are larger airports. The closest airport in Spain is Sabadell Airport in a distance of 10 mi (or 16 km), West. Besides the airports, there are other travel options available (check left side). There are several Unesco world heritage sites nearby. The closest heritage site in Spain is Works of Antoni Gaudí in a distance of 9 mi (or 15 km), South-West. We discovered 10 points of interest in the vicinity of this place. Looking for a place to stay? we compiled a list of available hotels close to the map centre further down the page. When in this area, you might want to pay a visit to some of the following locations: Montgat, Vallromanes, Montornes del Valles, Badalona and Premia de Mar. To further explore this place, just scroll down and browse the available info. Let's start with some photos from the area. 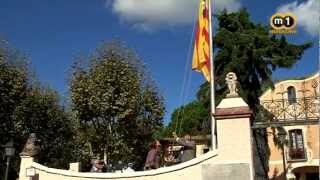 Video promocional d'Alella , amb la cançó " Ets Alella " composada pel cantautor alellenc Narcís Perich. " 1, 2, 3, com Alella no hi ha res " . 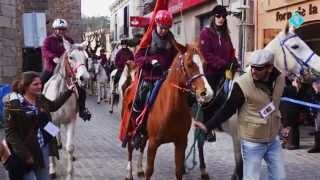 Alella ha celebrat aquest diumenge, 25 de gener de 2015, la festivitat dels Tres Tombs. El Sant Miquel Restaurant, de Vallromanes, en la muestra gastronómica de Alella, el pasado 7 de septiembre. Maresme is a comarca (county) located along the Catalan Mediterranean coast in Spain, between the comarques of Barcelonès (at the Southwest) and Selva (at the Northeast), and also bordering with Vallès Oriental (at the west). Its capital and largest city is Mataró (pop. 119,035 in 2007). Located at 41.5167, 2.3 (Lat. / Lng. ), about 2 miles away. El Vallès (or simply Vallès) is a historical county in Catalonia, Spain, located in the center of the Catalan Pre-coastal range. It is nowadays represented by two separate administrative divisions which are part of the Barcelona Province, named comarques. One of them is the Western Vallès, which has two capitals, Sabadell and Terrassa, whereas the second comarca is the Eastern Vallès, with Granollers as its capital. Located at 41.5646, 2.25769 (Lat. / Lng. ), about 5 miles away. Montgat is a municipality in the comarca of the Maresme in Catalonia, Spain. It is situated on the coast between Badalona and El Masnou, to the north-east of Barcelona. The town is both a tourist centre and a (somewhat exclusive) dormitory town for Barcelona. The A-19 autopista, the main N-II road and a RENFE railway line run through the town. Located at 41.4667, 2.3 (Lat. / Lng. ), about 2 miles away. Located at 41.444, 2.238 (Lat. / Lng. ), about 5 miles away. Located at 41.4442, 2.23806 (Lat. / Lng. ), about 5 miles away. 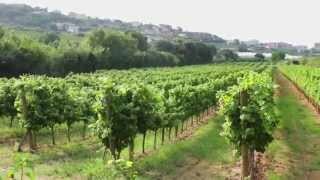 Alella is a Spanish Denominación de Origen (DO) (Denominació d'Origen in Catalan) for wines produced in Maresme county in the Spanish autonomous region of Catalonia, located on the Mediterranean coast, 15 km to the north of the city of Barcelona. It is one of the smallest DOs in Spain as the vineyards have been encroached upon by urban development. At the present time it only covers one third of the area that it covered in 1956 when it was established, despite a territorial extension in 1989. Located at 41.4953, 2.29583 (Lat. / Lng. ), about 0 miles away. Located at 41.4408, 2.23389 (Lat. / Lng. ), about 5 miles away. Located at 41.4405, 2.23383 (Lat. / Lng. ), about 5 miles away. Located at 41.4517, 2.25139 (Lat. / Lng. ), about 4 miles away. Located at 41.5168, 2.3574 (Lat. / Lng. ), about 4 miles away. Located at 41.445, 2.23972 (Lat. / Lng. ), about 4 miles away. Located at 41.4571, 2.25114 (Lat. / Lng. ), about 3 miles away. Located at 41.4444, 2.23694 (Lat. / Lng. ), about 5 miles away. The Catalan Coastal Depression, Catalan: Depressió Litoral Catalana, is a natural depression between the Catalan Pre-Coastal Range and the Mediterranean Sea. It is part of the Catalan Mediterranean System. It runs along parts of the following comarques: Empordà, Gironès, Selva, Maresme, Vallès, Barcelonès, Baix Llobregat, Penedès, Tarragonès, Baix Camp and Baix Ebre. Located at 41.4828, 2.28167 (Lat. / Lng. ), about 1 miles away. Located at 41.5167, 2.23333 (Lat. / Lng. ), about 4 miles away. Montornès del Vallès is a municipality in the province of Barcelona and autonomous community of Catalonia, Spain. The municipality covers an area of 10.2 square kilometres and as of 2011 had a population of 16042 people. Located at 41.5333, 2.26667 (Lat. / Lng. ), about 3 miles away. Located at 41.5061, 2.24 (Lat. / Lng. ), about 3 miles away. Vallromanes is a village in the province of Barcelona and autonomous community of Catalonia, Spain. The municipality covers an area of 10.7 square kilometres and as of 2011 had a population of 2,396 people. Located at 41.5339, 2.30222 (Lat. / Lng. ), about 3 miles away. Vilanova del Vallès is a village in the province of Barcelona and autonomous community of Catalonia, Spain. The municipality covers an area of 15.2 square kilometres and as of 2011 had a population of 4975 people. Located at 41.5553, 2.28639 (Lat. / Lng. ), about 4 miles away. The El Masnou Municipal Nautical Museum (Catalan: Museu Municipal de Nàutica del Masnou) is a municipally owned museum, the backbone of which is El Masnou’s relationship with the sea. It is part of the Barcelona Provincial Council Local Museum Network, the Maritime Museums of the Catalan Coast Network and the Mediterranean Maritime Museum Association. Located at 41.4826, 2.31467 (Lat. / Lng. ), about 1 miles away. The Montmeló Municipal Museum is a museum in the town of Montmeló, Catalonia, Spain. The museum is located in an old manor house, Can Caballé, which was built around 1920. In 1987, the town council bought the building and in 1996 approved its refurbishment as the home of the future museum, which opened in 1998. The Museum is part of the Barcelona Provincial Council Local Museum Network. Located at 41.5524, 2.24972 (Lat. / Lng. ), about 5 miles away. Located at 41.5049, 2.34676 (Lat. / Lng. ), about 3 miles away. Located at 41.4885, 2.35227 (Lat. / Lng. ), about 3 miles away. Located at 41.5193, 2.35673 (Lat. / Lng. ), about 4 miles away. These districts belong to Alella. These are districts that are close by, but belong to a different city than Alella. These are some bigger and more relevant cities in the wider vivinity of Alella.